Dr. Martha Hawes has been a pioneering researcher on plant root border cells. I became fascinated with their role while researching the fungal/plant communication in the rhizosphere of goldenseal (Hydrastis canadendis) during my doctorate. I called her lab hoping someone might speak with me. She answered and spent an hour pointing out important research papers and suggesting approaches I might take to incorporate root border cell research. She was always open to helping anyone with a curious mind and passion for the subject into which she’d immersed her career efforts. I’m grateful to her for showing me generosity and kindness. Plant root border cells are formed at the root tip where physical and biological interactions occur with the soil and microbe communities. The cells are genetically programmed to separate from the rest of the root structure and from each other. Cell-wall degrading enzymes dissolve cell wall matrix material that holds plant cells together. These “outpost” remain biologically active, excreting proteins and smaller molecules into the surrounding environment. Both types of molecules act as signals turning on/off gene expression to stimulate or prevent the growth of soil-borne bacteria and fungi. One important role appears to be in establishing a symbiotic relationship with mycorrhizal fungi (see previous post). 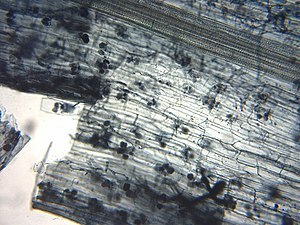 Few plants such as the Arabidopsis thaliana, which do not produce root border cells, also do not form mycorrhizal associations. In most plants, the content of border cells are accessible only to microorganisms able to recognize and respond to specific root signals. Among the compounds located in root border cells of various plants, medicinally valuable isoflavonoids modulate stable ecological relationships between mycorrhizal fungi and plant root tissue. These fungi stimulate the production of isoflavonoid in plant root tissue, while simultaneously the isoflavonoids increase mycorrhizal spore germination. The spores are an important survival mechanism used by the fungi. Measuring the activity in root border cells in “real time” as they interact with fungi is one of the great challenges to plant biologists. Hawes, M,C. et al (1998) Function of root border cells in plant health: Pioneers in the Rhizosphere, Annual Review of Phytopathology, 36:311-327. Hawes, M.C. et al (2003) Root Caps and Rhizosphere. J. Plant Growth Reg. 21:353. Kape, R. et al (1992) Legume root metabolites and VA-mycorrhiza development. J. Plant Physiol. 141:54-60. Well, dirt plus nutrient content. Organic farmers know that it’s really about the soil. In particular, the “living” component of the soil. Researchers are now catching up with findings that help explain why soils on organic farms and in native woodland ecologies have greater concentrations of fungal spores in the soil and greater levels fungal colonization of plant roots – particularly the symbiotic or helpful fungi. Mycorrhizal fungi form a symbiotic relationship with plant roots, each exchanging benefits with the other. The plant gains phosphorous from the extended “root-like” threads of fungal hyphae, while the fungi absorb glucose stored in plant root cells, which was originally metabolized (made) by the plant during photosynthesis. Additional benefits these fungi provide the plants include enhanced disease resistance, soil stability and structure, as well as nitrogen fixation. However, the fungus cannot be cultivated in the absence of a host plant root. Commercial farming often suffers from dead soil. The USDA’s Eastern Regional Research Center (ERRC) focuses research on the use of mycorrhizal fungi to improve crop quality and yield. Researchers at this facility try to understand the necessary chemical signal exchanged between plant and fungus required during the various stages of fungal development. Their aim is to grow the fungus on artificial media without the presence of plant roots. Because of the numerous benefits that mycorrhizal fungi provide, commercial farmers hope that a fungal inoculum could then be used to limit the amount of fertilizers applied to large scale crops while still improving plant growth and health.